The Ōhiwa Harbour is a large shallow estuary situated 11 kilometres east of Whakatāne and 16 kilometres west of Ōpōtiki in the Eastern Bay of Plenty. The harbour is one of New Zealand's most unspoiled and the area has long been special to many people for many reasons. It is home to a multitude of marsh and shore birds, shellfish and fish species. Boating, sightseeing, swimming, water sports, shellfish gathering and fishing are all extremely popular with locals and visitors who appreciate its landscapes, natural beauty, water quality, recreational activities, heritage places and values, clean air and productive land. The catchment extends far inland into the upper reaches of the Nukuhou River. Gentle undulating ground turns to steep hills and a multitude of peninsulas, spurs and gullies form a convoluted harbour edge dotted with salt-marshes, wetlands and mudflats. The inner harbour is protected to the northwest by the Ōhope spit and to the northeast by the Ōhiwa spit and dunes system. There are 10 small islands in the harbour and many channels and sandbanks that shift and meander with the tides and seasons. The harbour surrounds an area with a mix of native vegetation, exotic forestry, horticulture and pasture with many lifestyle blocks, clusters of houses and baches and the large residential area of Ōhope. We have identified Ōhiwa Harbour as an area of significant natural heritage value due to its ecological, natural character and landscape values. Areas of the estuarine margins and multiple islands within the harbour are protected by legislation and several locations are listed as wetland protection areas. Development and recreational activities in the harbour and catchment, with protection or enhancement of natural and cultural values, is the greatest challenge faced by the area. It is very important that activities which occur within the Ōhiwa Harbour and catchment are carefully managed to ensure that the quality of the environment of Ōhiwa Harbour and catchment is maintained. In 2008, Council created the Ōhiwa Harbour Strategy (OHS), a guiding document, in partnership with the Ōpōtiki and Whakatāne District Councils, Department of Conservation, Whakatohea, Upokorehe, Ngāti Awa and Tūhoe. Natural areas, plants and animals. The partners work collectively and individually to plan and take action for the management, protection and enhancement of the Harbour. The community also plays an important role in this work. Landowners and managers, and care groups have made, and continue to make, an enormous difference to the long-term health of the Harbour and its catchment. The Ōhiwa Harbour Strategy Coordination Group (OHSCG) is made up of representatives from the OHS partner organisations and meets four times each year. OHSCG members tend to work 'at the coal face' in their organisations, planning and managing the work that is relevant to caring for the Ōhiwa Harbour. Overseeing this work and providing project governance is the Ōhiwa Harbour Implementation Forum (OHIF). OHIF members tend to be politicians or elected representatives from each of the OHS partner organisations. OHIF meets twice each year. Bugs, bats, birds, bush…and water quality. A number of agencies and groups are responsible for carrying out ecological and water quality monitoring in and around the Ōhiwa Harbour. The ecological monitoring programme assesses such things as bats, invertebrates, threatened plants, native vegetation, marsh birds, freshwater fish and whitebait. The environmental monitoring programme has shown that water quality in the Ōhiwa Harbour is slowly improving, with a reduction in the amount of nutrients entering the harbour. While great news, erosion in the catchment is still bringing too much sediment into the harbour and more work remains to be done to address this issue. For up to date data about the Nukuhou River, visit the LAWA (Land, Air, Water Aotearoa) website (see below). Riparian management, which is the care and protection of the banks or margins of a waterway, is of vital importance in the Ōhiwa Harbour. Erosion of stream and river banks can cause sediment and nutrients to enter the Harbour, affecting its water quality and biodiversity. Stock in the Harbour or catchment stream margins has a real impact on how much sediment enters the Harbour. Council has worked hard for many years to exclude stock from these places. A number of catchment streams flow into the Harbour and fencing work is on-going to protect them from stock access. Most of the 28.8 kilometres of Ōhiwa Harbour catchment’s stream margins are fenced or planted to prevent stock access. Protection work is also underway on the 146.5 kilometres of the Nukuhou River and its tributaries. The Whakatāne Kiwi Project is enormously successful. Since 1999, when four breeding pairs were found by the Department of Conservation in the Ohope reserves, more than 300 North Island brown kiwi chicks have been raised in or released to local reserves. Whakatāne is the only place in New Zealand where kiwi live in such numbers so close to an urban area. 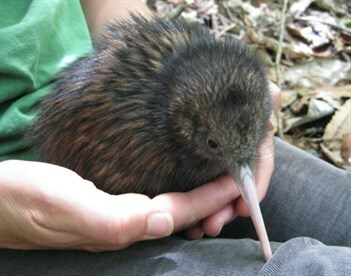 The Project aims to ensure that kiwi thrive and prosper in the Whakatāne district by restoring kiwi populations through public support and landowner co-operation. The Project manages kiwi in the Whakatāne area under a memorandum of understanding between Department of Conservation (DOC) and the Bay of Plenty Regional Council. The Project works on joint DOC, Ngāti Awa and Whakatāne District Council administered land (Ōhope Scenic Reserve, Moutohorā Island, Mokorua Scenic Reserve and Kōhi Point Scenic Reserve), private forestry land (Waiōtahe), Māori Trust land (Wainui, Omataroa) and other private land (Wainui). There have been many contributors to the success of the Project. One of the most significant contributions is the 'hands on' management undertaken by current project manager, Bridget Palmer, her predecessors and hundreds of volunteers. The group works to control predators, like possums, rodents, mustelids and cats, and monitor kiwi in the core protection areas of the Whakatāne and Ōhope reserves. Another contributor to the Project's success is the unique partnership supporting it. This partnership involves Ngāti Awa, Bay of Plenty Regional Council, Department of Conservation and Whakatāne District Council. The Whakatāne Kiwi Trust oversees the project and carries out fundraising, corporate sponsorship, volunteer and education programmes. Project field staff and volunteers have found, through tracking the kiwi using telemetry equipment, that many of the birds are migrating south from Whakatāne and Ōhope as far as Stanley Road and sometimes beyond toward Taneatua. The team work closely with landowners, foresters and residents in these areas, so that kiwi are afforded greater protection in their travels. Long term, the Project hopes to bring more landowners on board and extend predator control activities to their land, so that kiwi and other native wildlife have safe havens all around Ōhiwa. The Upokorehe hapū gained resource consent in 2011 to remove outlying mangrove plants and seedlings from the Ōhiwa Harbour. Upokorehe spokesperson Maui Manuel said: "The work can be challenging in the heat and soft mud, so our team would work very hard for several hours, and then have a great social time and barbeque". Upokorehe is the only group in the Ōhiwa Harbour to have a resource consent (a permit from Council) to remove mangroves. Through 'hands on' experience, the group is now expert in how best to do this work. An important feature of the mangrove removal project is recognition of the value of mangrove habitat (particularly for the rare banded rail bird), so not all mangroves can be removed. Instead, there are defined areas where removal is desirable. The muddy mangrove habitat is generally less rich in desirable bird and shellfish species than the sandy substrate areas of the Harbour. Considerable research was carried out into the ecology and spread of the mangroves. In recent years, mangrove populations have increased enormously and scientists agree that if left unchecked, mangroves could potentially cover a large proportion of the harbour. Click here for more information about the sediment and mangrove plan. Mangrove removal will help fine mud particles flush out of the Harbour, leaving coarser material. This provides a better home for the native worms and invertebrates that wading birds and fish live on, and for pipi and cockles. Photo points were established at each removal site. These photos, taken before and after each working bee, provide a visual record of changes over time. The project is an example of iwi exercising their kaitiakitanga of the Harbour by leading action that benefits the Harbour. Removing mangroves outside the conditions of the resource consent is not allowed. However, if you are keen to help out with this work, please contact Tim Senior at the Bay of Plenty Regional Council at 0800 884 881, ext 6010. In recent years, extreme rainfall events have taken their toll on Ngāti Awa Farm, located on the fringes of the Whakatāne and Ōhope urban areas, and the Ōhiwa Harbour. 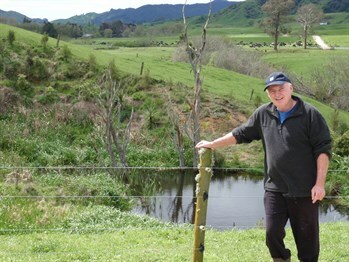 Frequent heavy downpours have caused significant erosion on the farm's steep slopes and in the streams, causing economic, environmental and operational problems for its owner, Ngāti Awa Group Holdings. Council land management staff began farm assessment and planning work for Ngāti Awa Farm in 2009. Farm managers have used the information and recommendations to drive land-use change and management decisions. Examples of land use changes on the farm include conversion of pastoral land to tree production, steep pastoral land to indigenous forest and swampy pasture to wetland. Ray Thompson, environmental manager for Ngāti Awa at the time, said the iwi is very pleased with the project. "This has not only allowed for diversification of this land parcel owned by Ngāti Awa, but it has also enabled us to use our lands in a more sustainable way," said Mr Thompson. Nukuhou farmer improves water quality in the Nukuhou River and Ōhiwa Harbour. Noticing deteriorating water quality in local streams, Nukuhou farmer Norm Craig contacted Bay of Plenty Regional Council for help in 1995. This began a co-operative relationship that has led to the retiring of 10 kilometres of stream edges from cattle grazing and replanting it to filter farm run-off and reduce stream-bank erosion. As a result, multiple wetlands for silt capture and beautification were created. Water quality in the Nukuhou River and Ōhiwa Harbour is slowly improving, showing that the efforts of people like Norm Craig are paying off. Mr Craig remains committed to the 'cleaner and greener' approach. He says: "It's so much more satisfying if the work is aesthetically pleasing. It's all about quality of life - fresh air, nice places around you that give you enjoyment, being proud of what you've done and sharing it with others". Nukuhou farmers caregivers of the land. Farmers like Margaret and Michael Kirk of Fairview Farm in Nukuhou believe they have a 'duty of care' that goes beyond their rights as landowners and extends to being caregivers of the land. "We aim to leave the land better than when we came to it," said Mrs Kirk. Mr Kirk considers, "We're collectively responsible - those who are farming upstream have a responsibility to care for the stream to enable those downstream to carry out their activities". The Kirks came from the Hawkes Bay to Fairview Farm in 1989, and soon after, ring-fenced 28 hectares of native bush to remove stock from the steeper regions of the farm and increase slope stability. After the fencing, the farmers used poison to control possums and within a year, the trees were flourishing and birdlife had flooded back. The bush is now home to shining cuckoos, kaka, grey warblers and flocks of kereru, tui and bellbirds. With financial assistance and advice from the Council, the Kirks have also fenced the length of the small Horowera Stream that runs through their property. They have planted the streamsides in native vegetation and built a new bridge to keep stock and vehicles out of the stream. Leo Ducker was the first pakeha child to be born at Ōhiwa, on 24 June 1906. He was the fifth of seven children, and was born prematurely to his mother, Lily Eyes. His father Frank Ducker was away at sea working as a steward on ships travelling between Auckland and Australia. A local Māori woman delivered Leo in the unpainted shed on the hill behind Ōhiwa that was the Ducker home. Lily was not able to feed Leo and so a Māori wet nurse fed him. Leo graduated to Highlander condensed milk and then cow's milk when the family cow had calved and her milk came in. 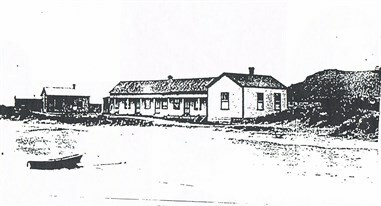 In 1911, at age five, Leo started school at Ōhiwa with his classmates from the Crowther, Black, Reid and Holiway families. The children mostly rode to school across the mudflats on horses or ponies, sometimes as many as four children to a pony! Leo's only sister, Olive, left the family to live with her grandparents and attend school in New Plymouth and only visited with the rest of her family twice, so Leo's childhood was spent mostly in the company of his brothers. The brothers would regularly play at the Ōhiwa Wharf, even though this activity was strictly forbidden by their parents. One day, while at play at the wharf when Leo was just five, he missed a plank and fell from the wharf down into the sea. It was lucky that Leo was wearing a large straw hat tied to his head as a local man, Mr Morrison, saw the straw hat floating towards the Ōhiwa bar. Mr Morrison dived in, swam to Leo and pushed him to shore, saving him from certain drowning. When Leo's mother and father got home that night there were 'spanks all round'! Read more about Leo Ducker's life on Uretara Island.